Is Level 1 for me? Students learning to coach in groups of three using the Coaching Cards Resource Pack. The coach, the coached and the observer. What can I expect from Level 1? What you can expect whilst on this 2 day programme is to learn and ‘drill’, through practice, a solid set of coaching skills and principles that will enable you to build a solid foundation as a coach to start coaching others. 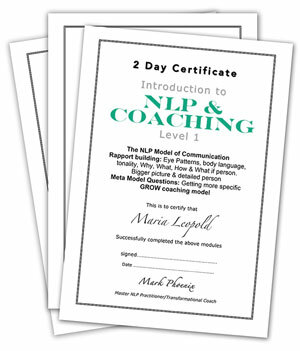 You will also learn an Introductory module ‘NLP for coaches’ giving you additional cutting edge NLP* coaching skills to ensure your efficency and success as a coach. You will receive a Certificate on successful completion of this course. 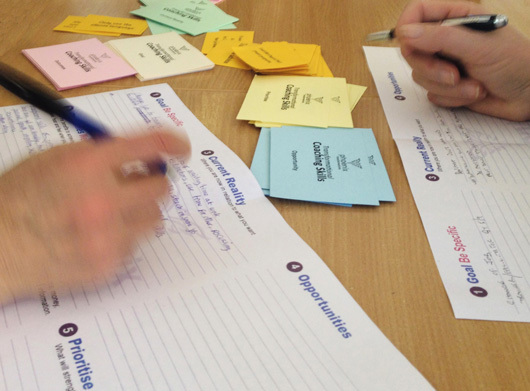 The Coaching Cards Resource Pack contains 96 coaching questions. There are two main purposes to asking coaching questions in a coaching session 1) the purpose of gathering information and 2) asking questions for the purpose of guiding the client to explore their resources and gain new perspectives. What is the Phoenix Coaching Pack? The Coaching Cards Resource Pack has been designed specially for beginners in mind, designed to take them step by step through the stages of becoming a successful coach. The pack includes 6 sets of coaching cards, one set of prompt cards, a coaching worksheet and a step by step booklet guiding you smoothly through the stages of how to coach. The Coaching Pack is ideal for learning to coach in groups, coaching clients one to one and also designed for self coaching! One of the mistakes a lot of coaches make is going into detail far too quickly in the initial stages of a coaching session rather than seeing the first session/s as an 'information gathering' session to gather the clients bigger picture. The coaching worksheet is A3 in size and provides you with a really efficient way to gather information from the client and to write it down. When you can see the clients bigger picture (on one sheet) it becomes easier to recognise patterns and for you to decide what direction to go in next with the client. 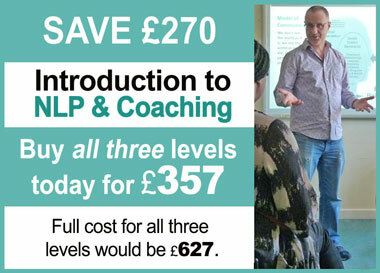 When you have completed and passed Level 1 you can then go on to do Level 2 which is as Intermediate Level and suitable for those who have completed Level 1 or for those who have some experience of NLP or coaching and want to refresh and build on their existing skills as a coach. 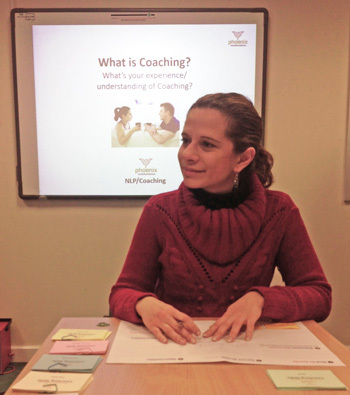 How to create strong rapport as a coach. Building positive rapport is the foundation to all successful coaching. Short review of week one, questions and answers: Opportunity to discuss and get clarity on any questions you have so far. 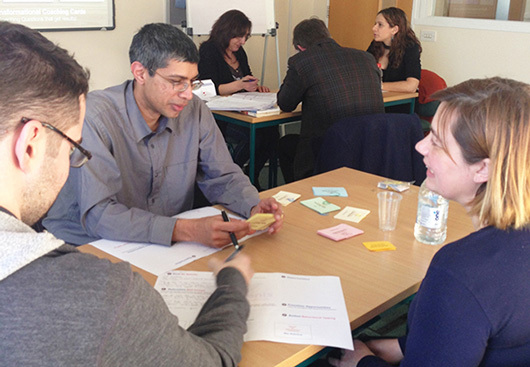 Effective coaching is about meeting someone where they are, assisting them to find out where they want to go and getting them to take action to bridge that gap. You will be awarded a certificate on the successful completion of all the units for each of the three levels you attend. Learning to coach can be difficult. As a beginner coach there are a lot of things that you need to concentrate on at the same time and to get right in order for you to get the results you and your client are looking for. Some beginner coaches give up learning in the early stages of being a coach as they slowly loose confidence realizing that coaching involves more skill and practice than they had originally thought. As a coach there’s so much information out there, so many things to learn, so many things to get right, it’s easy to get bewildered and confused not knowing where to focus and what to do to get the great results you’re looking for as a coach. Being a great coach involves thinking on your feet, knowing when to ask a question, knowing when to be quiet, knowing when to have a direct approach and knowing when to offer support and knowing where best to focus the client to help them to get the results they are looking for. And to be perfectly honest as a beginner all of this can be quite challenging and stressful. 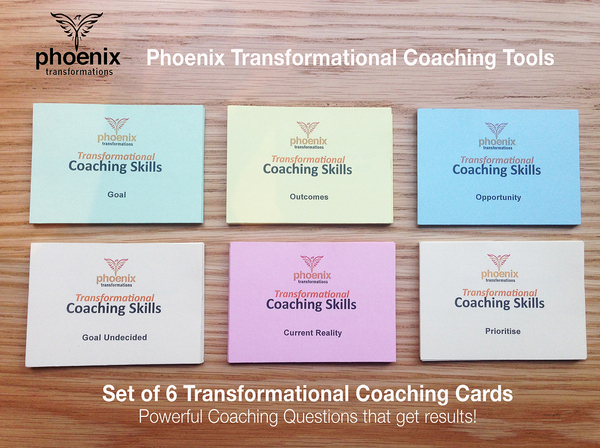 The Phoenix Transformational Coaching System™ will help you to make your early stages as a coach much easier and relatively stress free, giving you a proven system to follow that when followed will accelerate your learning and leave you free to focus more on the needs of the actual client rather than being overwhelmed with everything that you have to do as a coach! What do you get from Level One? Learn practical coaching tools along with additional NLP techniques in a small group of no more than 8 people. 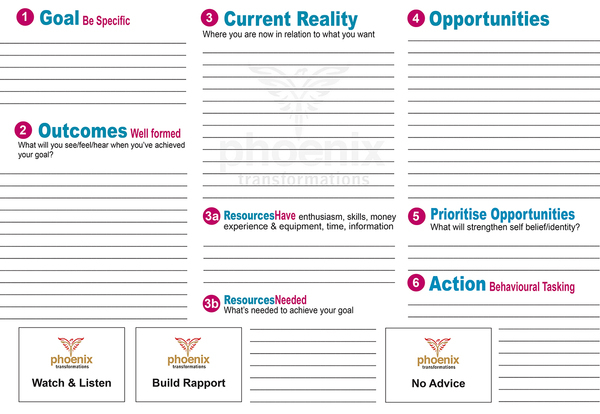 Practice coaching with my personally designed Phoenix Coaching Cards Resource Pack so initially you focus more on learning the strategies and tactics of becoming a brilliant coach. Learn and apply The 7 Essential Laws of effective coaching.